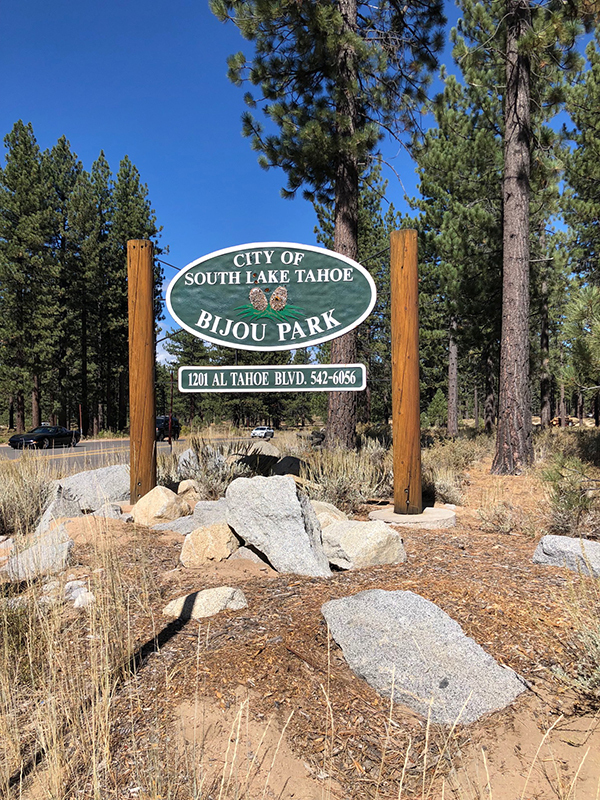 This was my first time attending Sample the Sierra at Bijou Park in South Lake Tahoe. The girlfriends I went with had all gone to last year’s event and really enjoyed it. 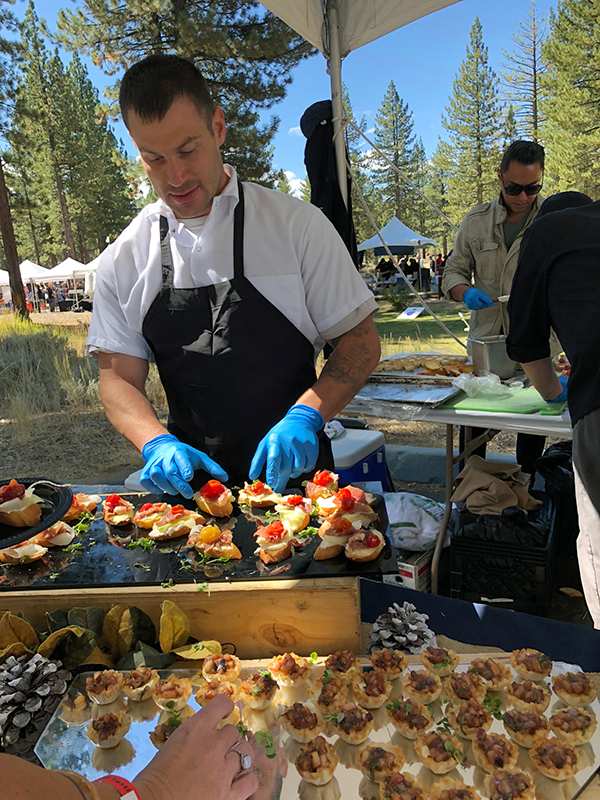 Sample the Sierra is Lake Tahoe’s largest farm-to-fork festival celebrating locally crafted food, wine and beer with local artisans spread throughout the event – fine art, glass art, pottery, jewelry, handmade soaps, jams, spice rubs, honey, olive oil and hand-knitted and screen printed clothing. 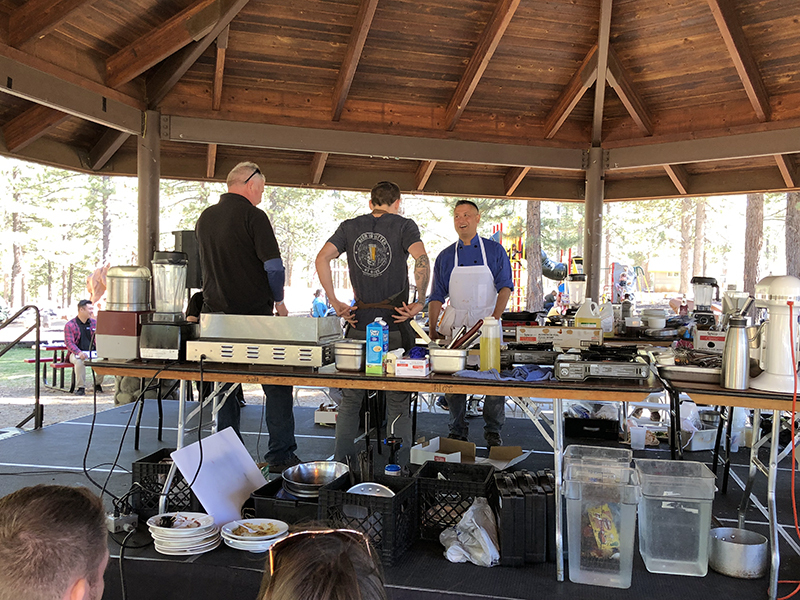 The event is sponsored by The Tahoe Chamber and a bunch of other local companies. 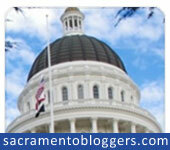 We had purchased our tickets months ago – thankfully, because the event always sells out. 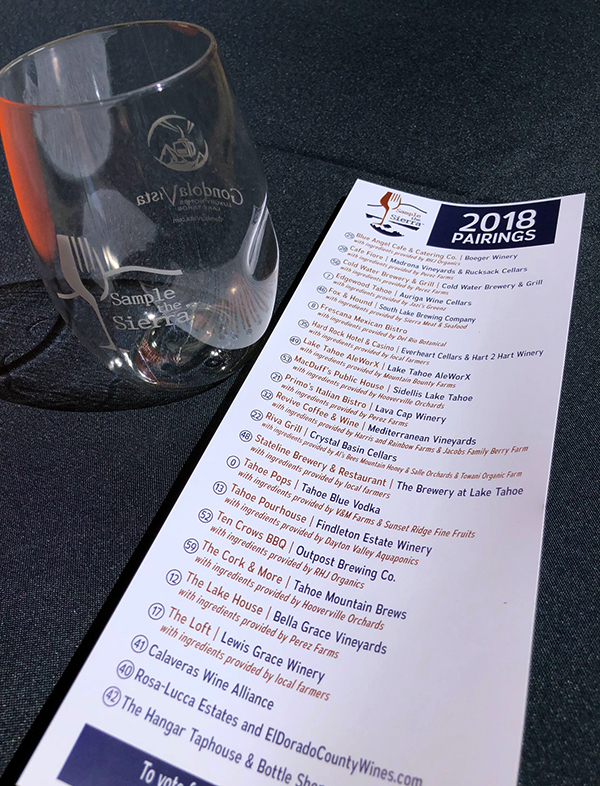 We waited in line, got our IDs checked, and then received our plastic tasting glasses and event pairing maps and started tasting our way from booth to booth. 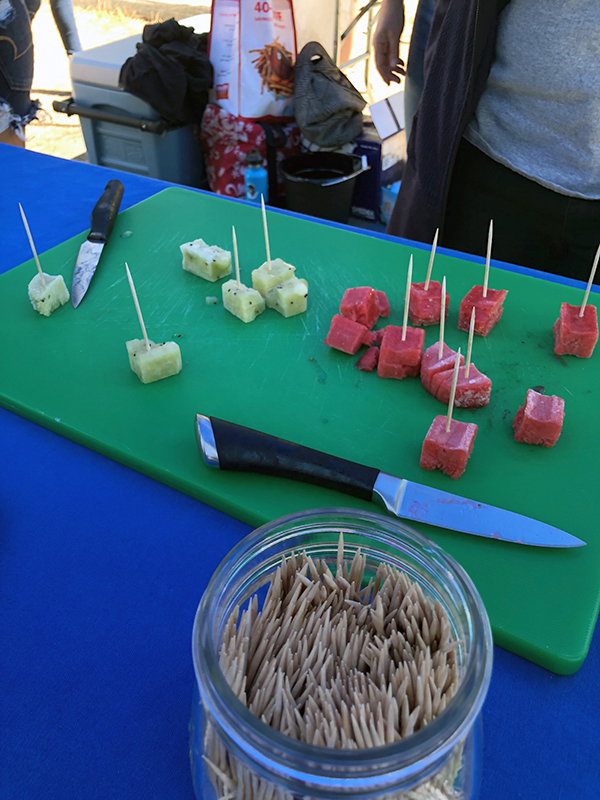 First up was vodka and popsicles – Tahoe Blue Vodka and Tahoe Pops. 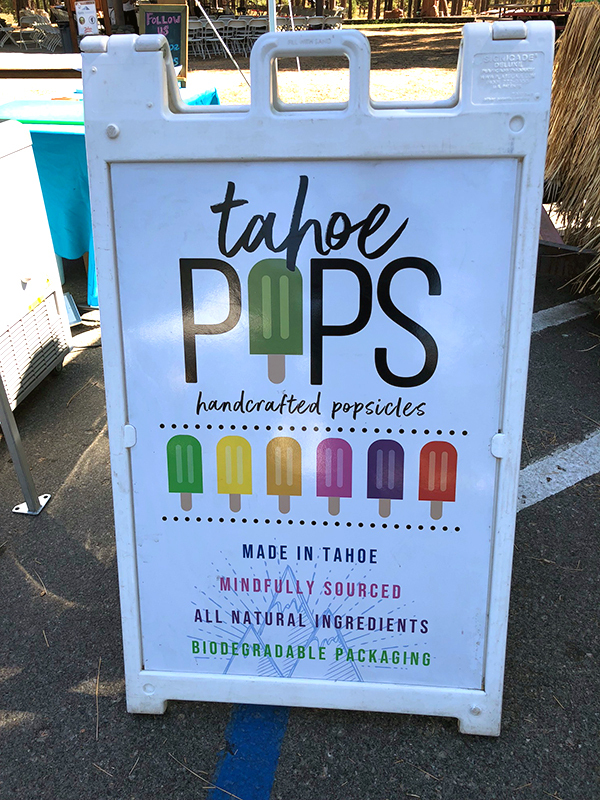 Tahoe Pops uses Tahoe water as their main ingredient and they try to source as locally as possible for the other add-ins. 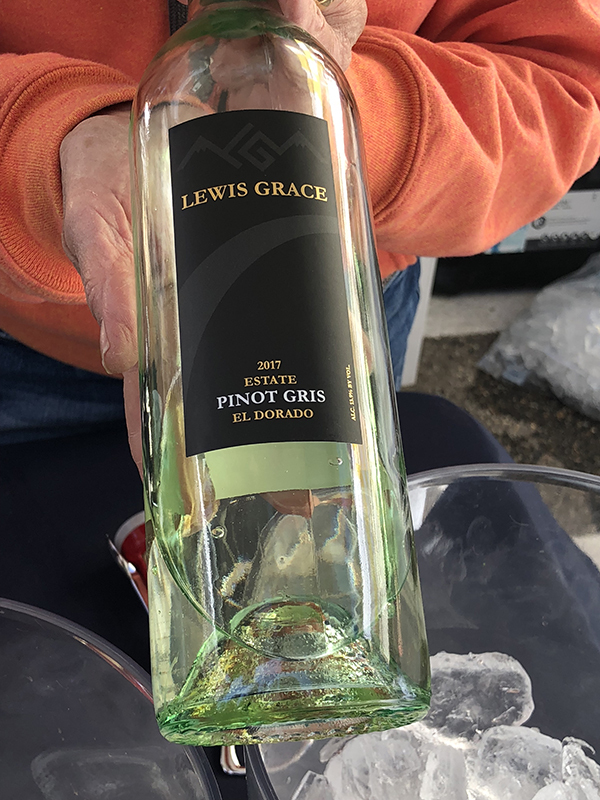 I tried their Kiwi Lime (Ingredients: Lake Tahoe water, organic kiwi, organic cane sugar, organic lime juice, organic tapioca dextrose, and xanthan gum) and loved it so much that later in the day I went back for seconds and scored a whole pop. Besides the samples, they had their Tahoe Pops Ice Shack nearby so you could purchase full size popsicles. 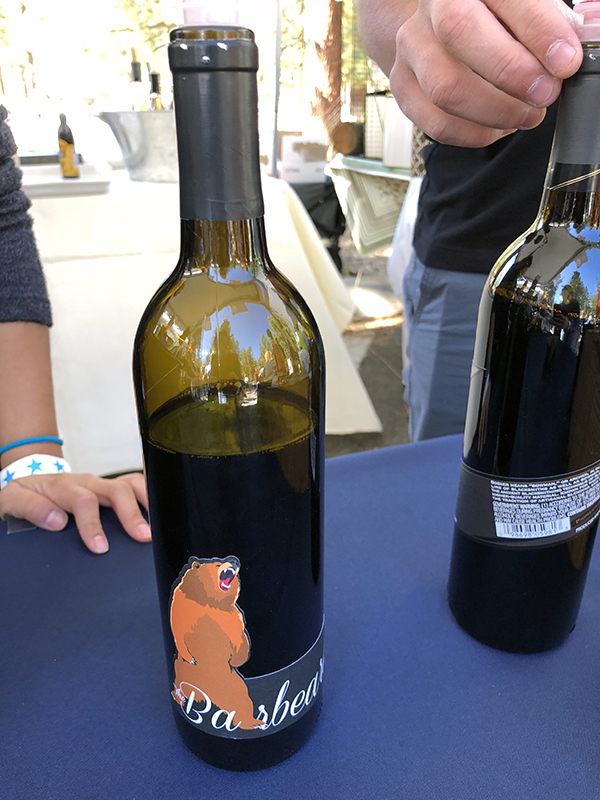 According to their website, Tahoe Blue Vodka is “Made with pristine Lake Tahoe water, artfully distilled in small batches in Mountain View, CA, carefully bottled in Sparks, NV.” – we all enjoyed the samples. Yep – there is a theme… water from the lake. I can vouch for Lake Tahoe water. I loved it as a kid when we spent summers there and it’s one of the only places around that I will drink it straight out of the tap without any filtering. 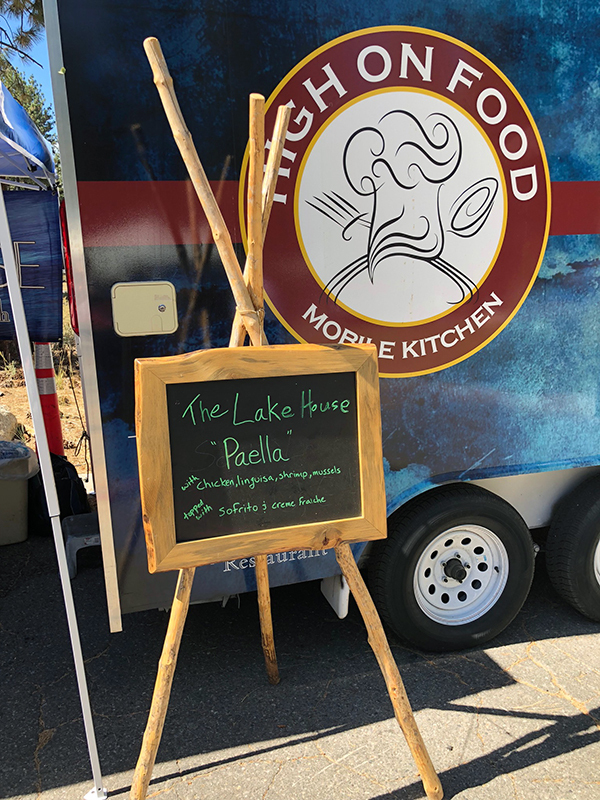 Our next stop was the Lake House/Bella Grace booth. Bella Grace Vineyards is located in Plymouth, CA. 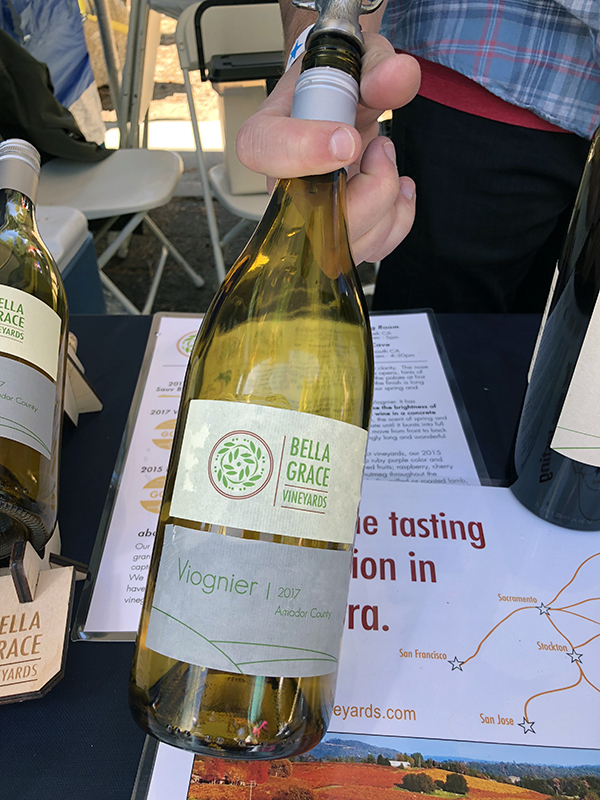 I sampled the 2017 Viogneir and found the hints of pear to be very refreshing. 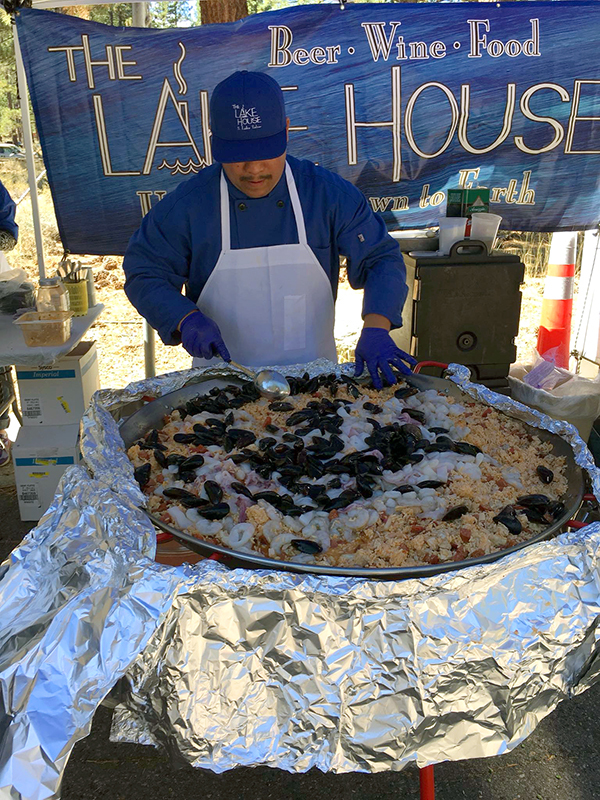 The food pairing was provided by The Lake House – Paella with ingredients sourced from Perez Farms in Crows Landing, CA. 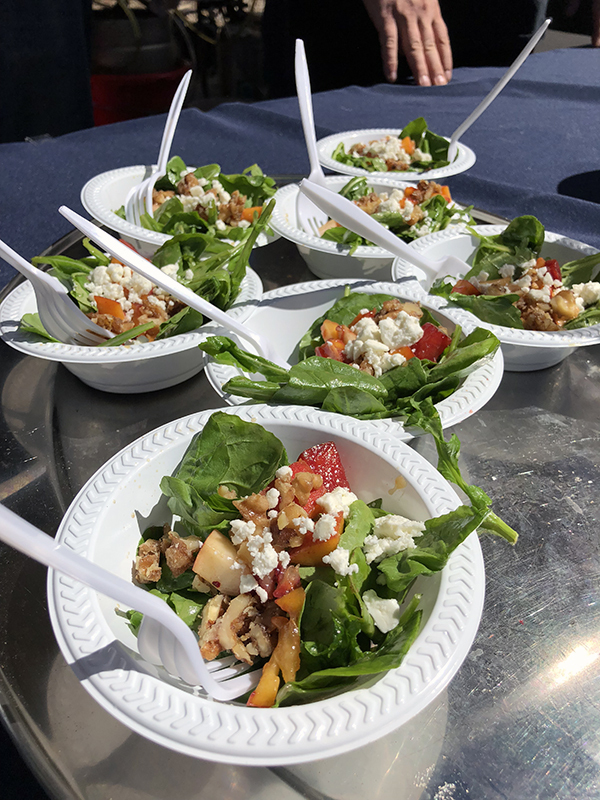 The Paella (Roasted chicken, linguica sausage, shrimp and mussels topped with sofrito and creme fraiche) wasn’t ready when we rolled through, but my girlfriend went back and tried it – she said that it was delicious – so photo credit and review goes to Kristen. 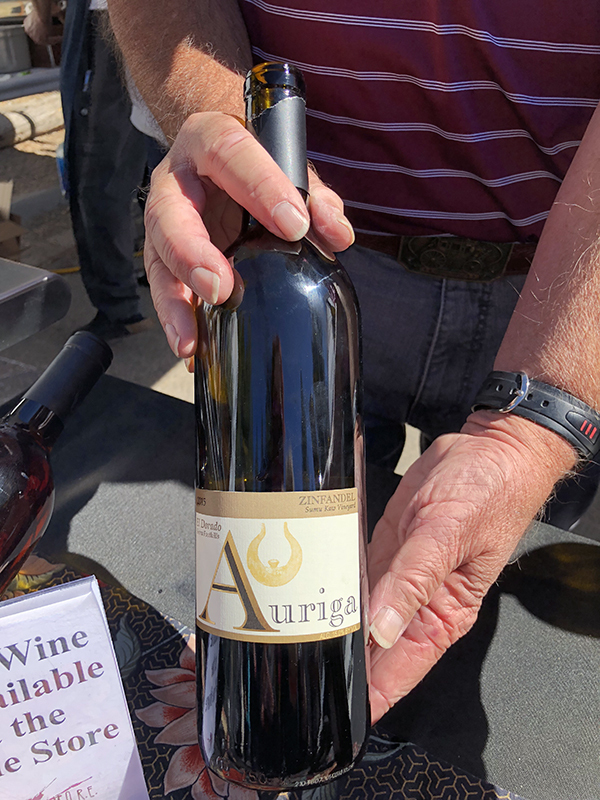 I was most excited to visit the Edgewood Tahoe/Auriga Wine Cellars booth. All senses were delighted from the visual beauty of the presentation to the amazing aromas… tasting did not disappoint and at the end of the day, I did give my poker chip to them as my favorite of the day. Edgewood chefs spent time with us explaining the ingredients as Denise and I weren’t able to identify one of them – Sea Ice. 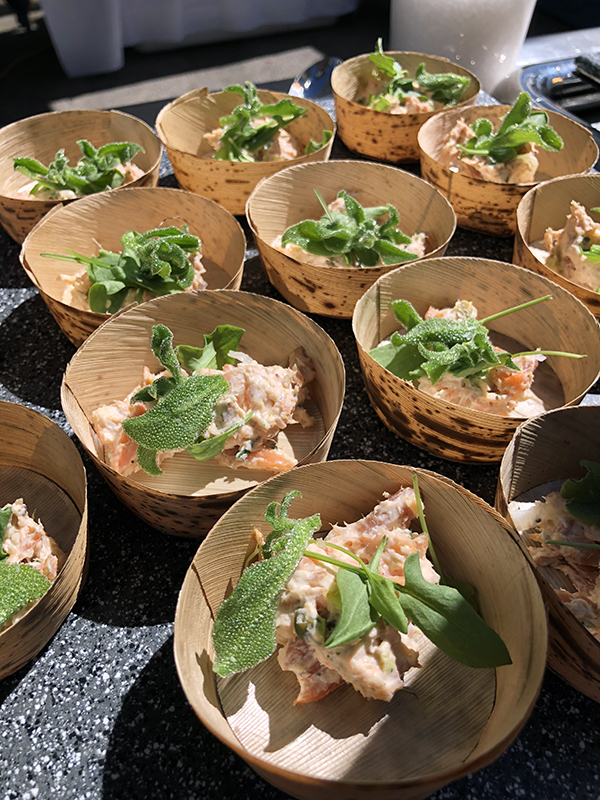 Trout salad with a quick pickle/sea ice as a topper. The presentation of all three Edgewood Tahoe items spoke to my inner designer self. I loved all of the details. I sampled the short rib and Denise and I both had the chocolate mousse. I mistakenly didn’t take a photo of the menu/ingredients – so I wish I had more details on each item. I sampled the Auriga 2015 Zinfandel for pairing with my short rib and the combo was perfect. This got me excited for colder weather ahead. 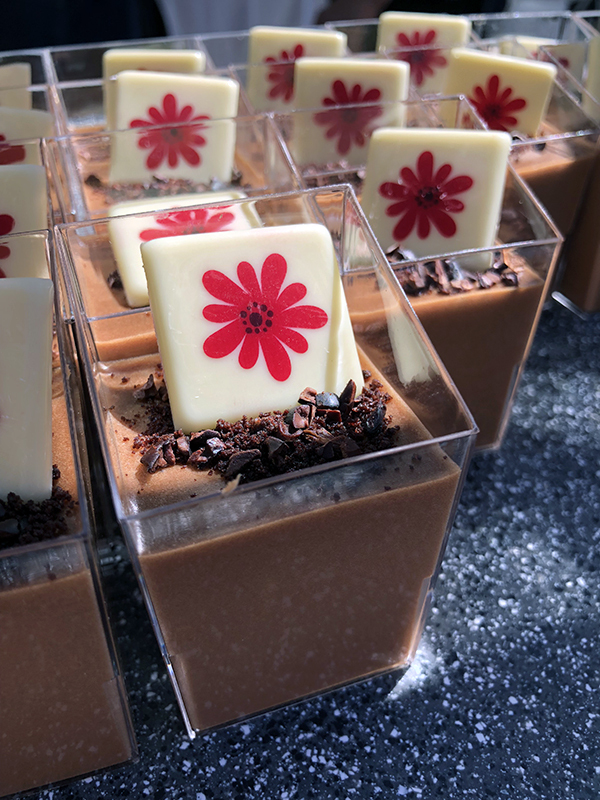 The mahjong style chocolate tile on the mousse prompted a conversation about Crazy Rich Asians and how I now need to go see the movie. 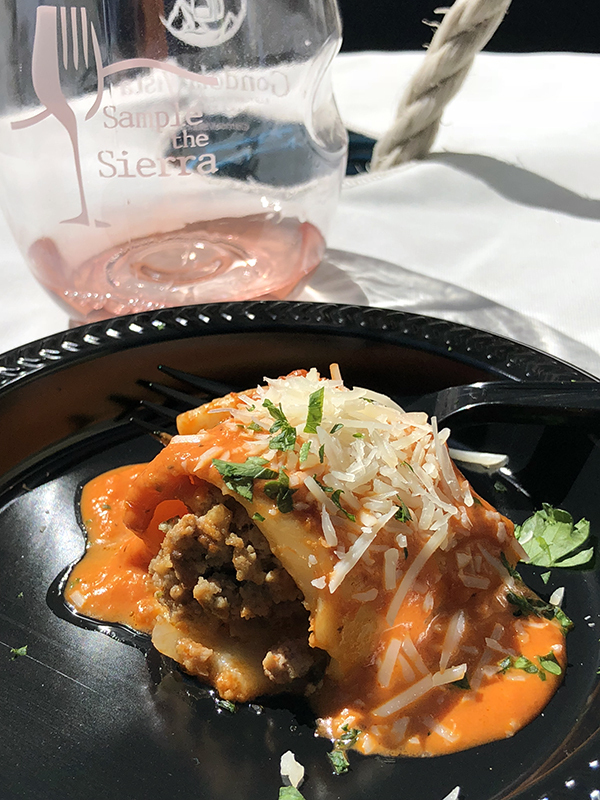 The Loft and Lewis Grace Winery had an excellent pairing – Wild Boar Cannelloni with Pink Vodka Sauce and Pinot Gris – another favorite of the day. The Loft encouraged us to check out their live theater magic show on our next trip to Heavenly Village. Primo’s Italian Bistro and Lava Cap Winery really delivered with what is probably the best Caprese Crostini I’ve ever tasted. 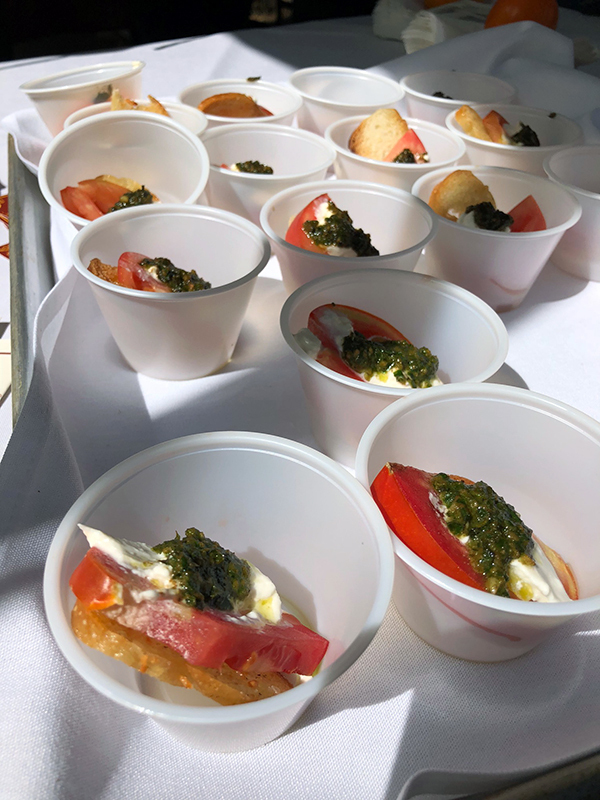 I loved the garlic and olive oil marinated tomatoes – teamed with perfectly toasted bread, creamy burrata (I think) cheese and the pesto topper. 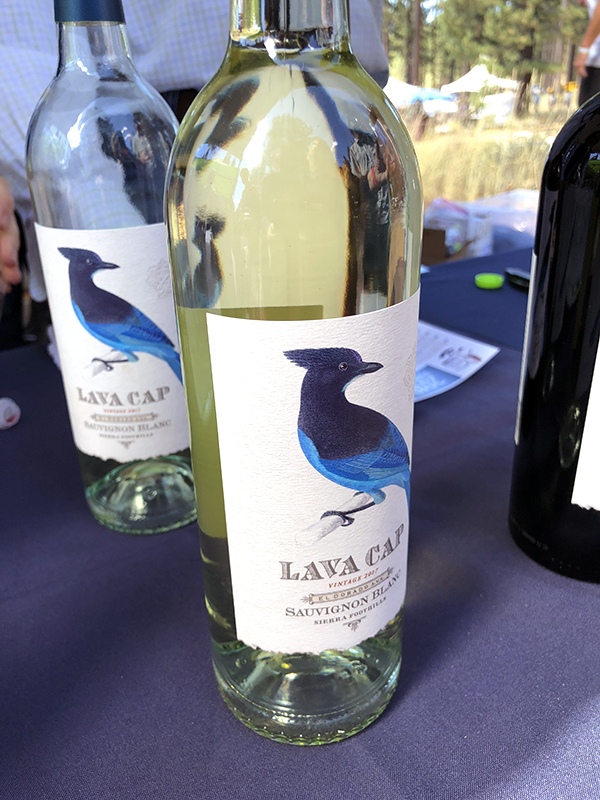 For the pairing, I had the Lava Cap Sauvignon Blanc. I was so excited to taste both, that once again I failed to photograph the signage with all of the details. Whoops… enjoying the moment for sure! Riva Grill and Crystal Basin Cellars were up next for us. 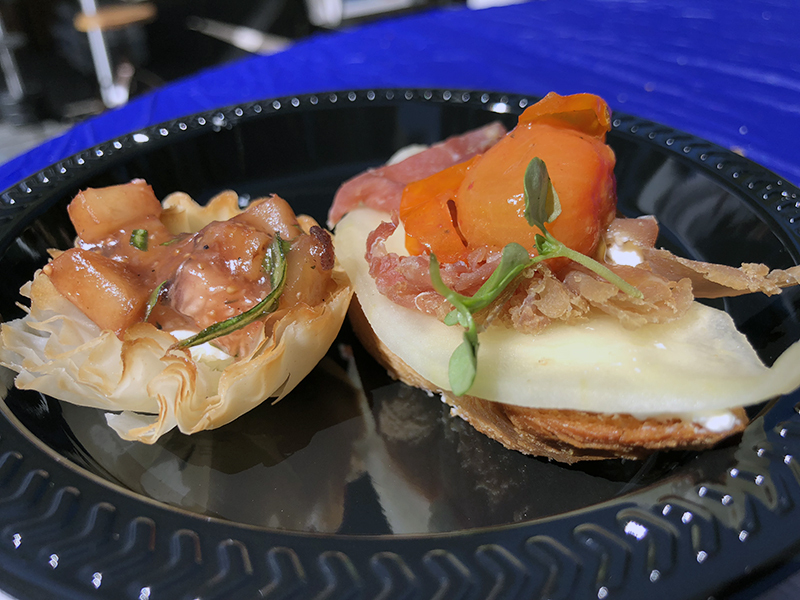 A goat cheese tart with grilled peach and fig bruschetta and the second item was baby arugula and whipped burrata toast with mixed melon, tasso ham, roasted grape tomato and micro basil. Yay, I remembered to get an ingredient photo. The honey was provided by Al’s Bees Mountain Honey & other ingredients were provided by Salle Orchards and Towani Organic Farm. 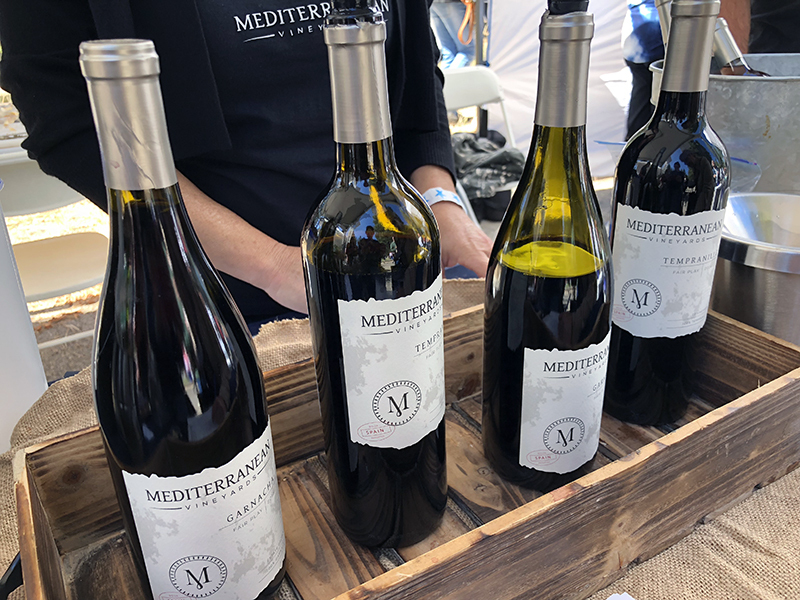 I didn’t sample any of the wine at this booth, but others did and really liked the Merlot. 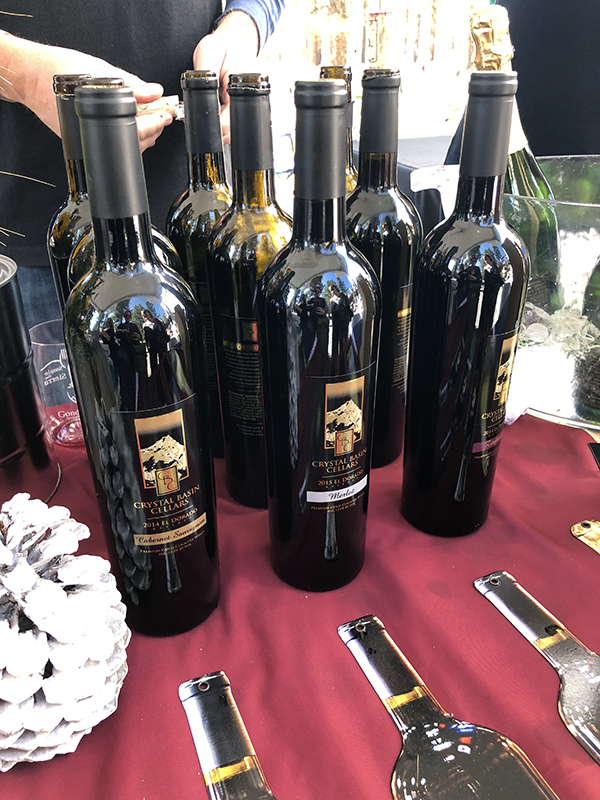 Blue Angel Cafe & Catering Co. teamed with Boeger Winery with ingredients from RHJ Organics out of Watsonville, CA – where my grandparents once lived. 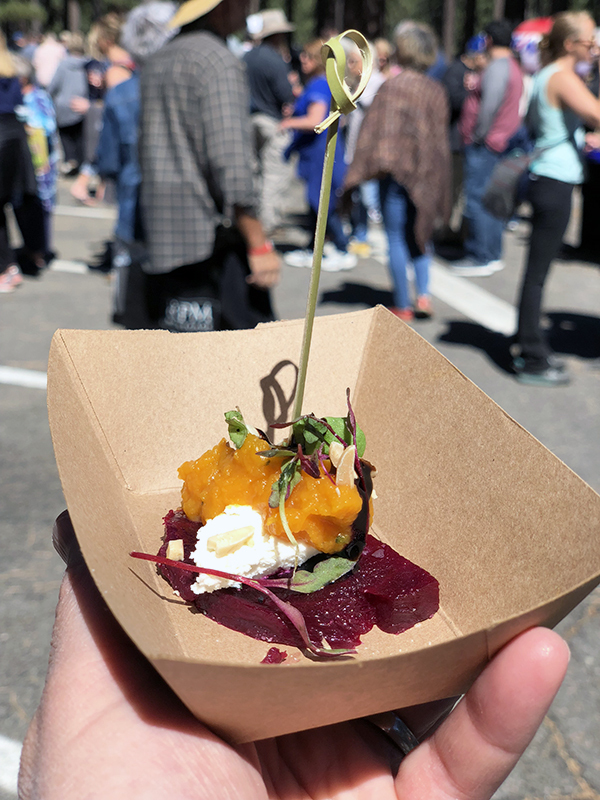 We tried a Beet Napoleon – layered with goat cheese, sage and butternut squash puree, topped with a balsamic glaze and microbasil garnish. We sampled the Boeger Barbera and it paired really well with the beets. I love beets, so this was right up my alley – I did overhear quite a few people “passing” due to the beets – they don’t know what they’re missing. 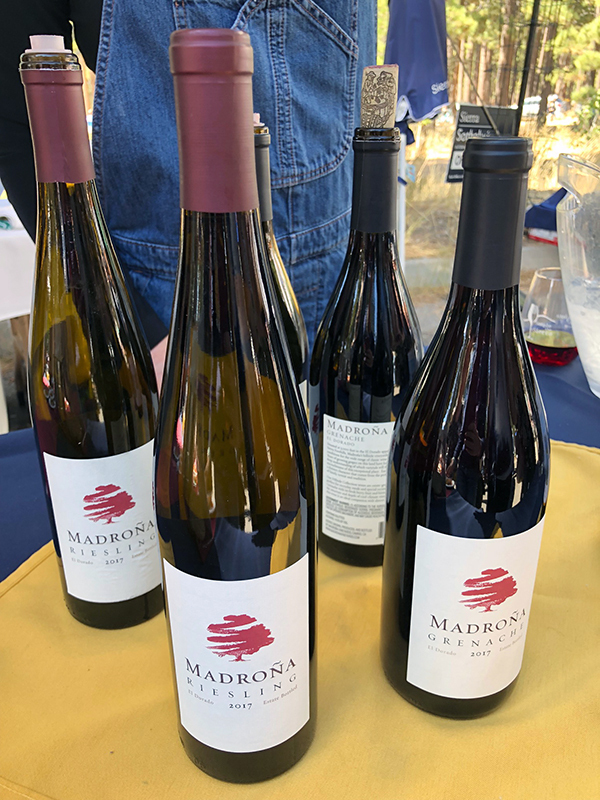 Cafe Fiore joined Madrona Vineyards & Rucksack Cellars for the pairing of chilled marinated veggies – broccoli, cauliflower, bell peppers, olives, onions, carrots, artichokes, tomatoes, garlic and fresh herbs with a pour of Madrona Riesling. I loved the refreshing combo, the veggies were a nice change to some of the other heavier items had throughout the afternoon. Perez Farms provided some of the ingredients. 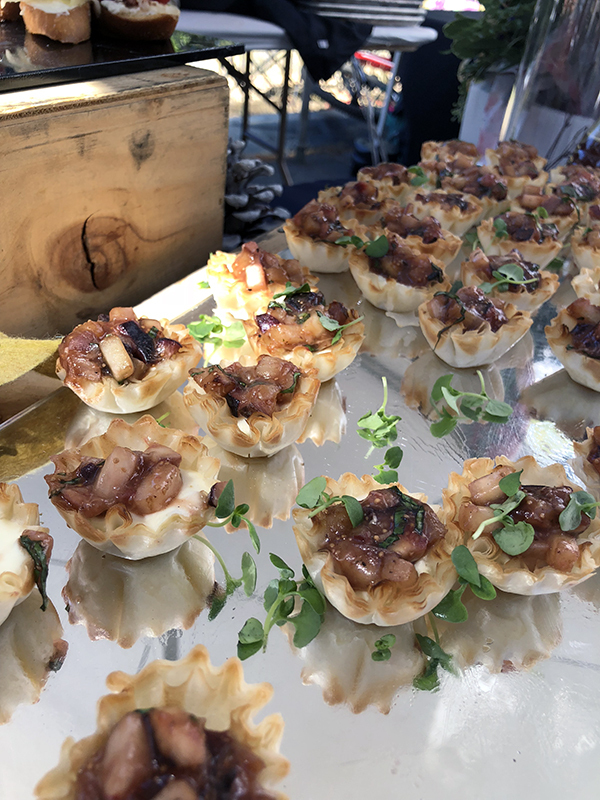 Dessert was enjoyed at the Revive Coffee & Wine and Mediterranean Vineyards pairing. 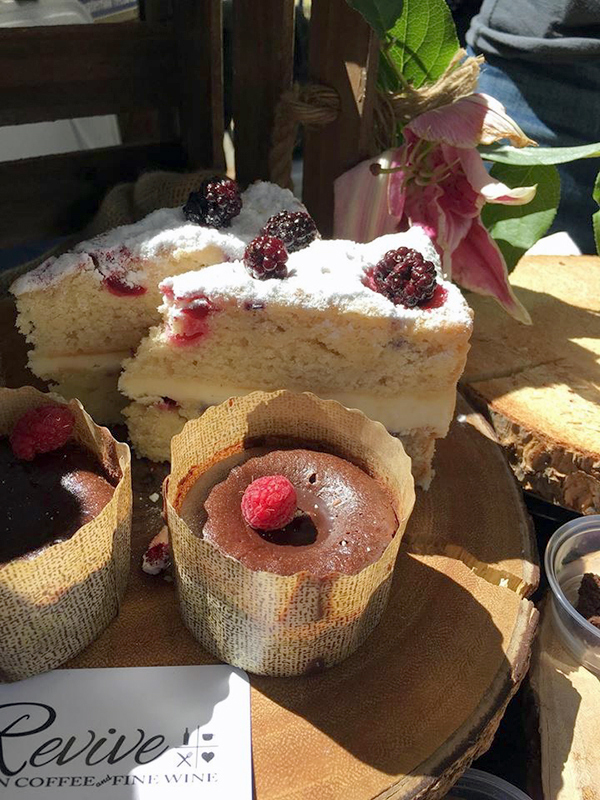 Lemon Blackberry Mascarpone Cake and gluten free Lava Cake topped with raspberries from Harris Tree Farm, Rainbow Orchards & Jacobs Family Berry Farm. The lemon blackberry cake was really sweet and paired nicely with the Mediterranean Vineyards Garnacha. 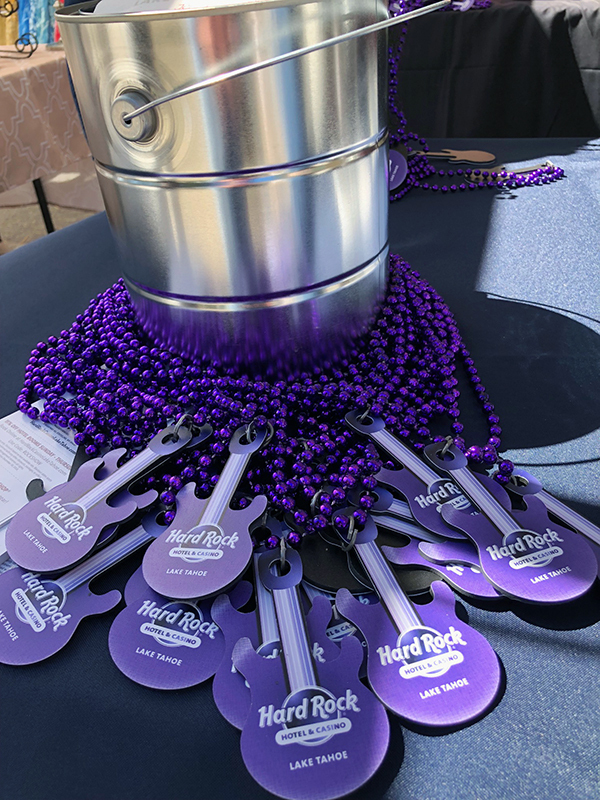 Hard Rock Hotel & Casino provided swag (Mardi Gras style beads, sunglasses, bottle openers/keychains and sunscreen along with their delicious (non-spicy) Jambalaya. Everheart Cellers & Hart 2 Hart Winery was a favorite of the group of girls I went with. Some purchased their wine to take home. I joined another girlfriend on the opposite side of the venue where all the beer was and missed out on the wine. 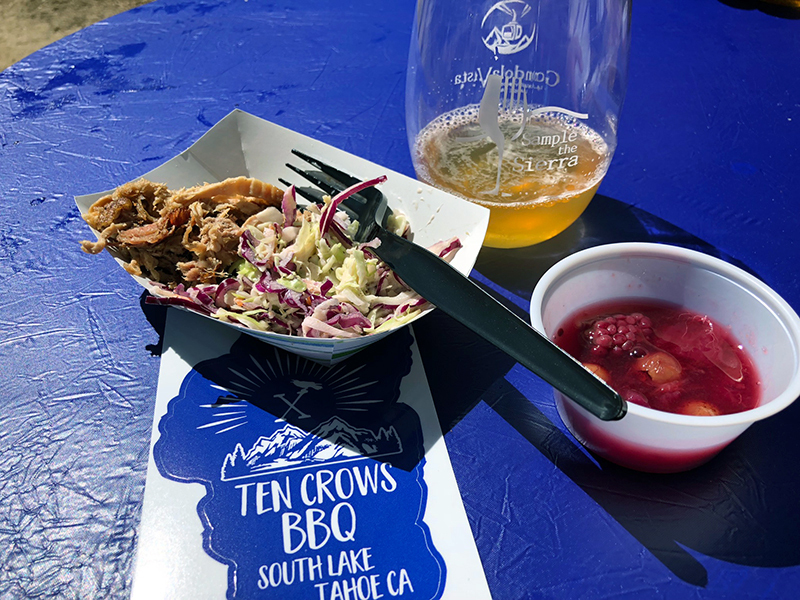 First up on the beer side was Ten Crows BBQ and their Pulled Pork topped with Coleslaw and a side of Seasonal Berry Cobbler – with ingredients provide by RHJ Organics. 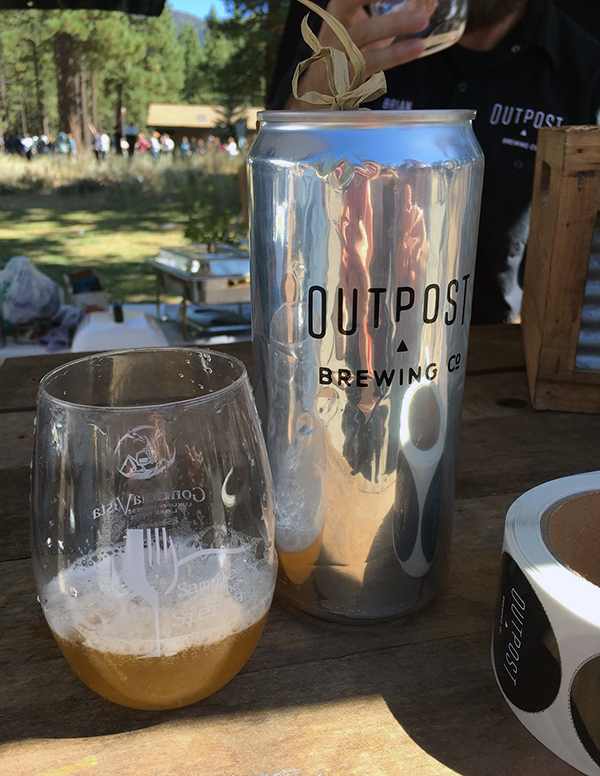 Outpost Brewing Co. was serving up the IPA suds. 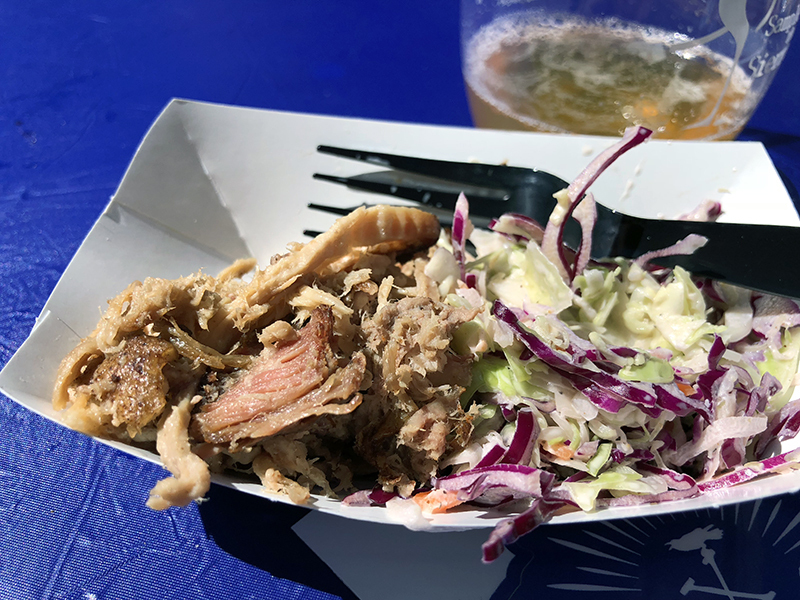 I loved the pairing – coleslaw is always a good choice as a side to pulled pork. The berry cobbler was more berries, way less cobbler, as in no cobbler. Ha-ha. Fox & Hound Smokehouse Grill and Bar and South Lake Brewing Co. served up St. Louis Style Ribs and craft beer which we waited in the longest line to sample. The ribs were sourced from Sierra Meat & Seafood. 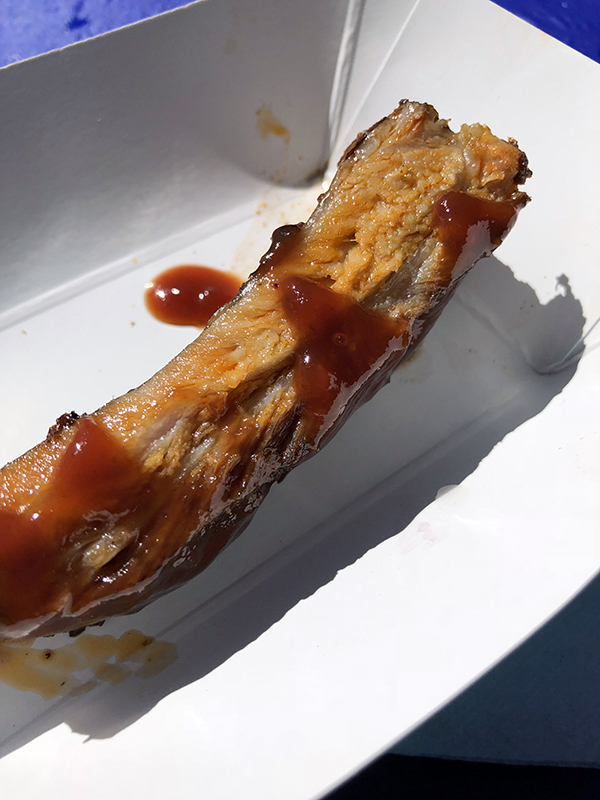 They were slow-smoked with cherry wood for 5-hours and served slathered with their signature mild BBQ sauce. The meat slid right off the bone and the sauce was full of tangy delight. They went home as winners of the Best Tasting Experience Award. All Sample the Sierra guests were given a poker chip to put in the glass jar of their favorite pairing and while they didn’t get my vote, they easily could have – the ribs were that good. Like I mentioned earlier, I voted for Edgewood, their items were amazing and the chef took time to chat with us, which I loved. 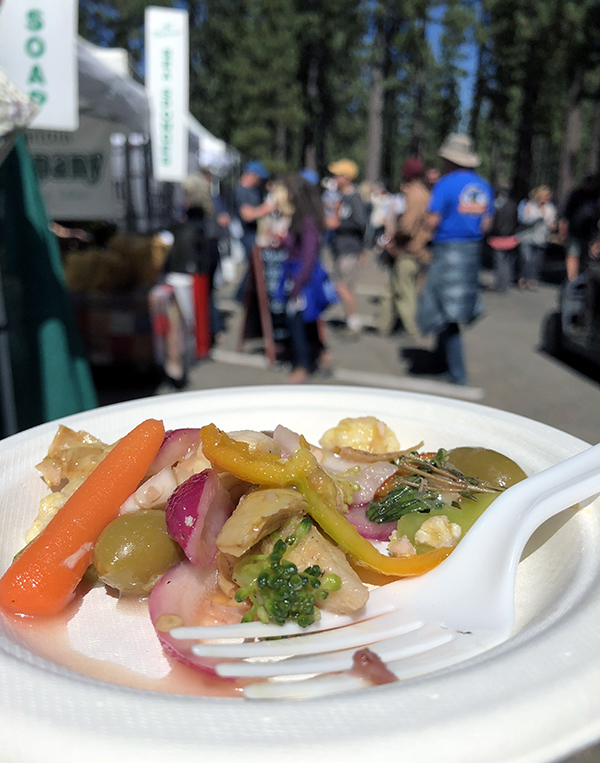 MacDuff’s Public House and Sidellis Lake Tahoe served up craft beer, Apricot Bread Pudding and Stone Fruit Salad with ingredients provided by Hooverville Orchards. I’ve eaten at MacDuff’s before and really liked it, so it was fun to see them as participants. 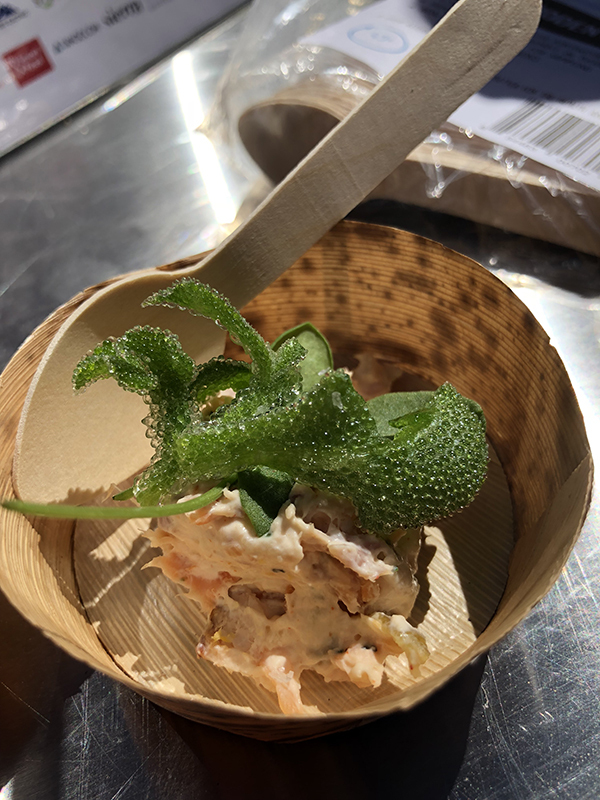 I know it seems like I tasted a lot, but I honestly skipped a bunch of booths due to the lines or wanting to hangout with the girlfriends I went with. Cold Water Brewery and Grill had a Mr. Toads Wild Rye beer that I wanted to try – but the line was crazy long. A light amber beer with a touch of rye, yes please. I missed the Frescana Mexican Bistro Blackened Ahi Street Tacos, but borrowed another photo from Kristen because she said they were incredible. 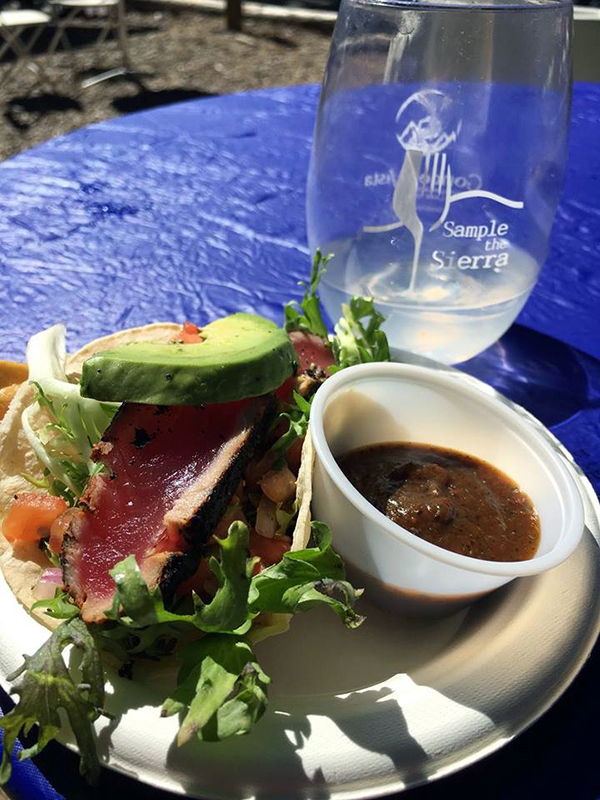 Wild caught sushi style ahi, avocado, cilantro-pepita dressing, frisee & pico de gallo served in a corn tortilla. This is the type of food I crave and order when dining out, so I’m bummed that I missed their booth. 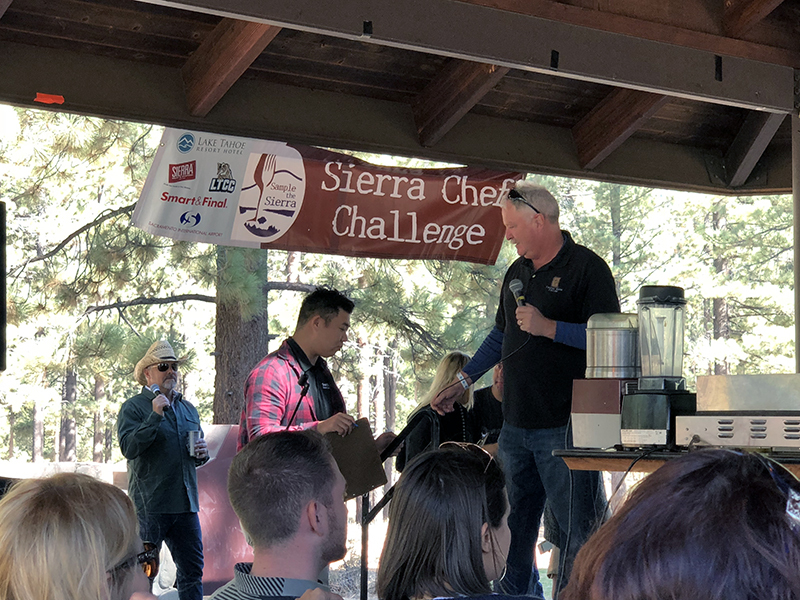 Once we made our way back to the beginning of the event – we noticed that the finals had just started for the 7th Annual Sierra Chef Challenge. This was a “Chopped” style challenge. 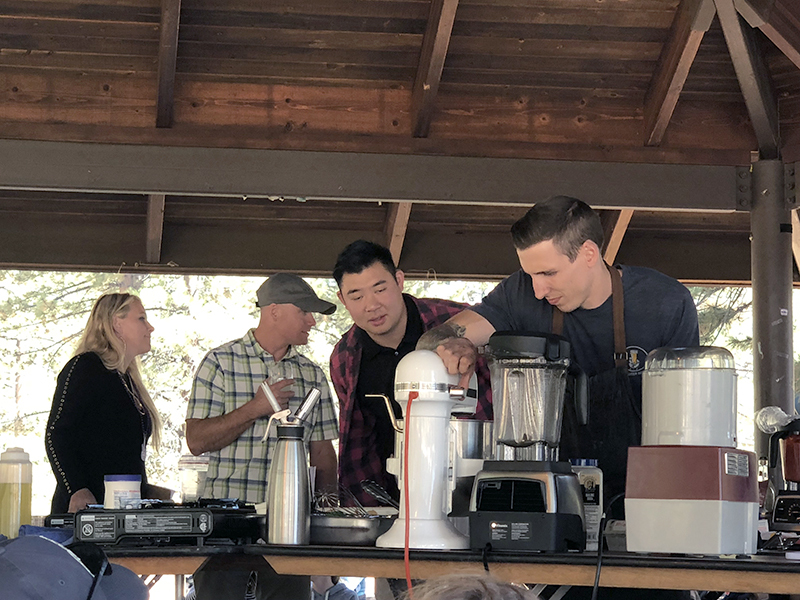 Four chefs each cooking against one another with a mystery box of food – they said locally grown, but one of the items was marshmallow fluff :). 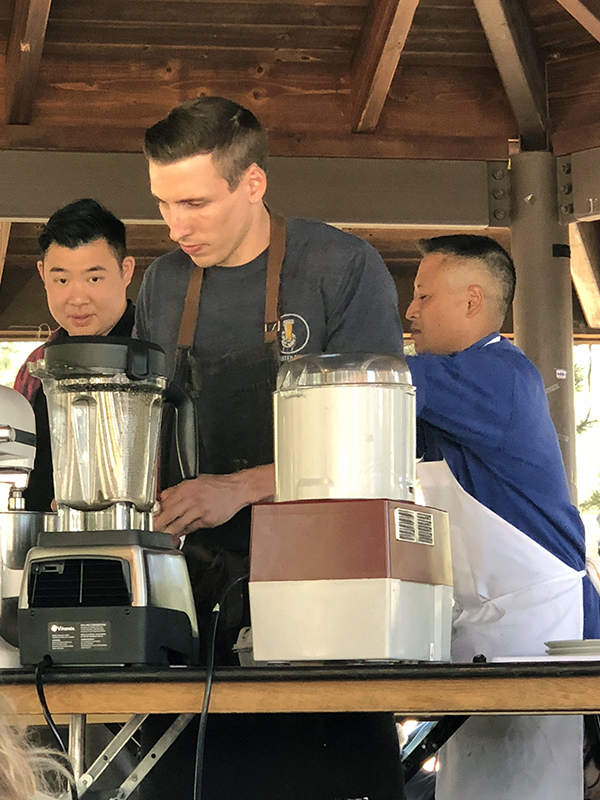 All chefs had 30 minutes to create each course per round. 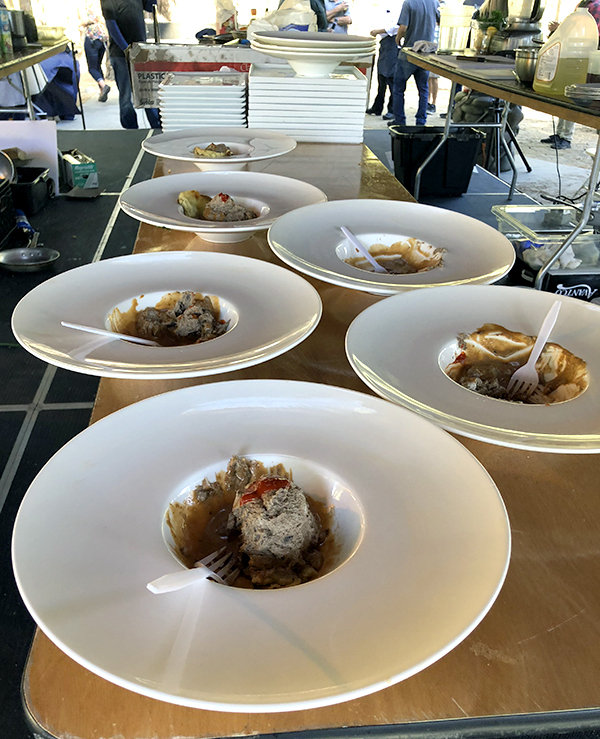 Appetizers were round one, three chefs moved onto round two for the entree course and then it was down to Chef Patrick Harrity from Cold Water Brewery and Grill and Chef Jimi Nakamatsu from The Lake House. Both chefs from places that I didn’t taste the food – Grrrr… Kristen knew what was up, she went to the right places, ha-ha. 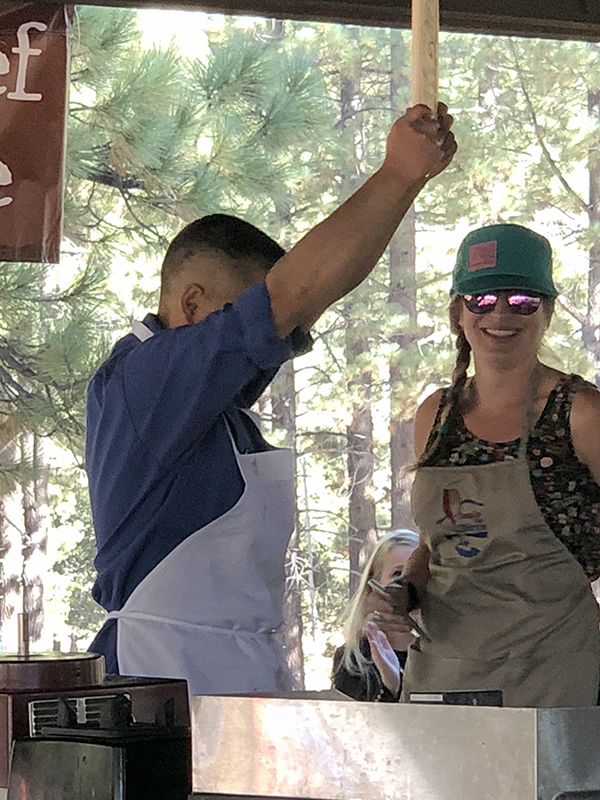 We were sitting on Chef Patrick’s side, he was the reigning Sierra Chef Challenge champion. 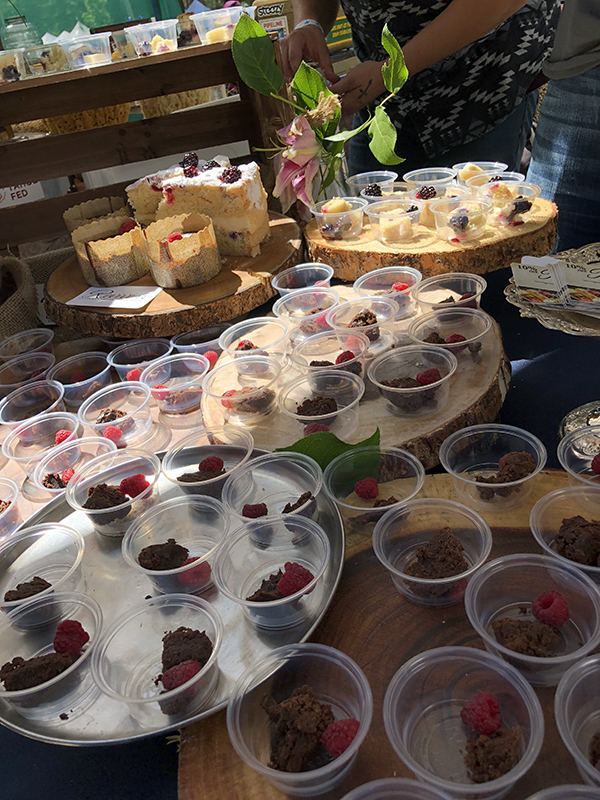 The dessert round mystery box was unveiled and it was hard to hear, but I’m pretty sure it included chocolate, pomegranate, marshmallow fluff creme and guajillo chiles. Chef Patrick made flat cakes (after an admitted baking fail) with a chocolate and pomegranate mousse and a guajillo chili marshmallow fluff creme anglaise. Chef Jimi made an open-face crepe sandwich with a pomegranate marshmallow fluff mousse that included the guajillo chilies for some added heat. The judges talked among themselves and then submitted the winner to the announcer. 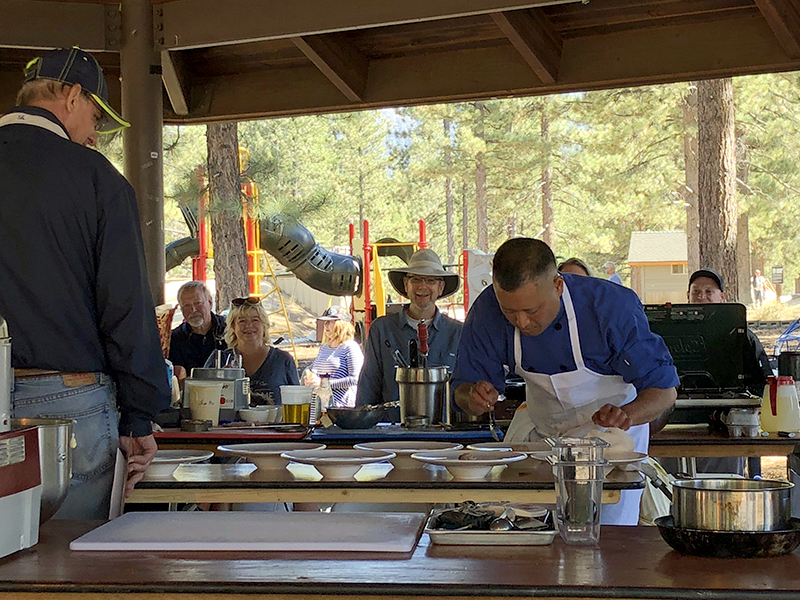 Chef Jimi Nakamatsu from The Lake House took the 2018 Sierra Chef Challenge Winner title. 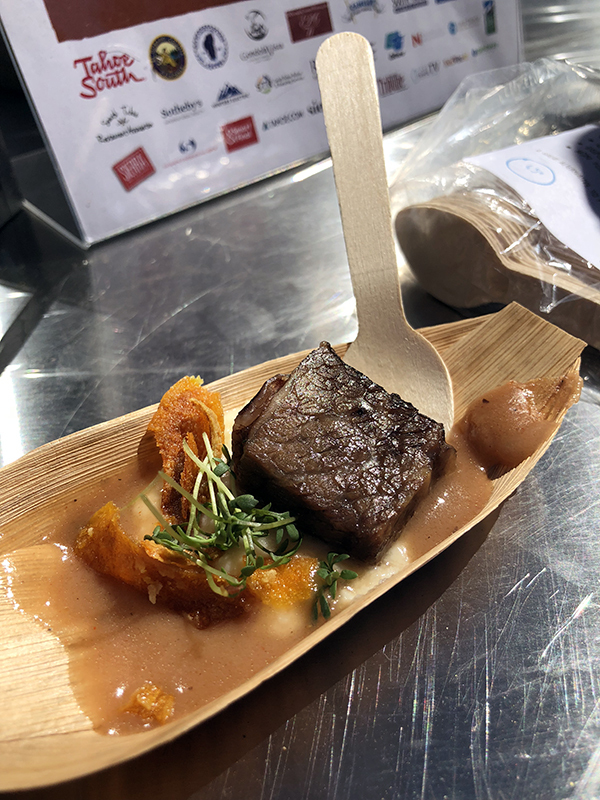 We even managed to get a taste of his winning dish – pretty cool. I had a wonderful day spent with my favorite things – good friends, delicious food, unlimited wine and beer pours, laughter, random dog sightings (including a white mini schnauzer named Oliver), a much needed post event hike and a simple green salad with roasted chicken for dinner. 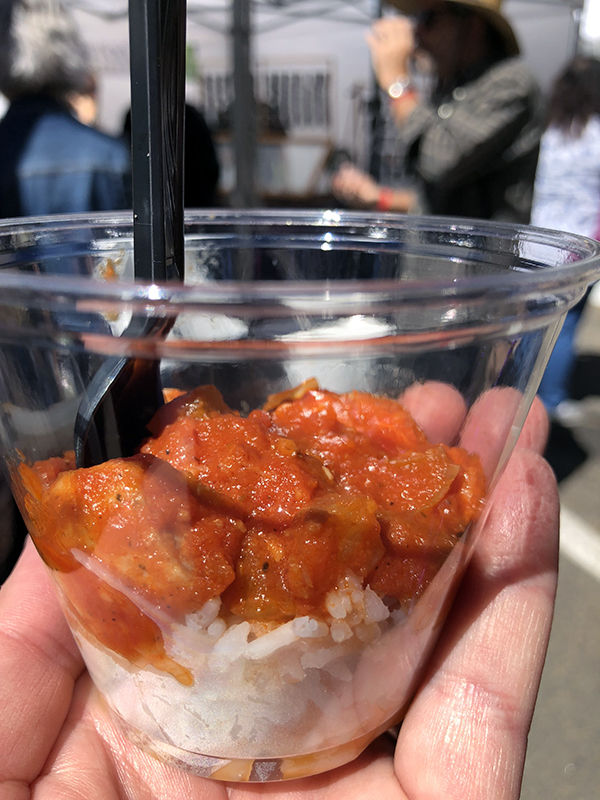 Thanks to everyone that let me borrow their food and wine to take photos, their actual photos when I missed stuff and for being patient while I took notes on my phone and filmed video so I wouldn’t forget things for this post. The upside – I was so busy eating that I didn’t spend money shopping for jewelry and other handcrafted treasures. Hmmm… wait a minute, that seems more like a downside kind of thing. Already looking forward to my next trip to Lake Tahoe – I sure do love it there. I had such a great time, already looking forward to next year! Thanks Emily! 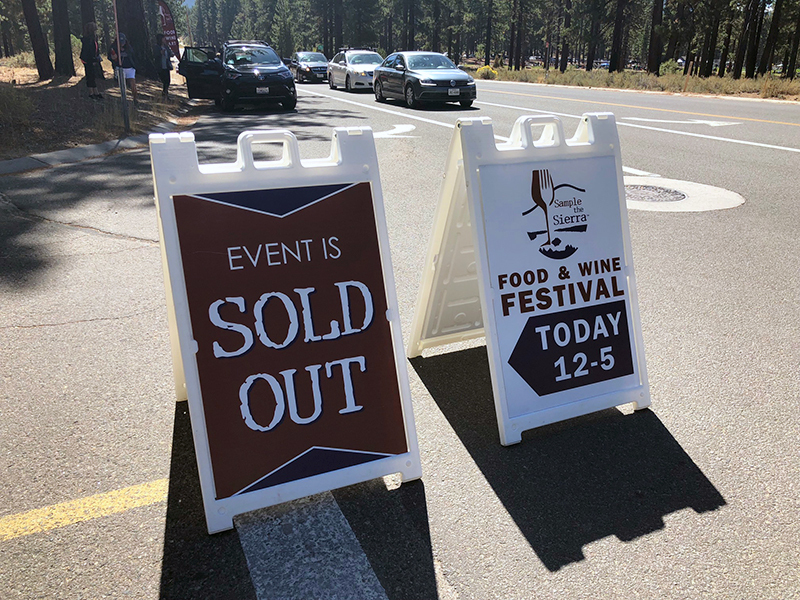 Aside from the yummy food and drink photos, it looks like you had near perfect Tahoe weather!!! This looks like a great event, something I’ll need to look in to! YES, the weather was dialed in. You should definitely check it out next year!